Built at the turn of the century, circa 1932, the luxurious Settha Palace Hotel in Vientiane, Laos has been restored to its former charm. Re-opened in 1999, the French colonial architecture, period furniture, landscaped gardens complemented by modern facilities, are some of the features of this historical landmark in the heart of Vientiane, the capital city of Laos. Settha Palace Hotel is a member of The Legends of Indochina together with other famous hotels such as Raffles in Singapore, Majestic in Saigon, Metropole in Hanoi, The Regent in Chiang Mai, Le Royal in Phnom Penh and Grand Hotel d'Angkor in Siem Reap, etc…. The hotel features twenty seven luxurious guestrooms and suites in French colonial decor with high ceilings and wooden floorboards, facing either garden or swimming pool. Wireless Internet Access is available in all guestrooms and throughout most of the hotel. Deluxe: 23 rooms with Rose wood 2 poster King bed or Twin beds and luxurious amenities. Junior suite: 01suite with additional amenities including a Living room with 3-seater Sofa and 2 arm chairs and a dining table. Executive suite: 02 suites with additional facilities and amenities available including a large living room with 3-seater sofa, 2 high back arm chairs and a large coffee table, a private bathroom for guests in the living room and a marble dining table. 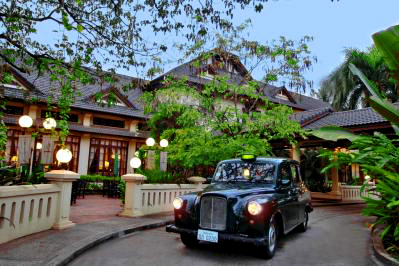 La belle epoque restaurant – serves classical French cuisine and seasonally-inspired Lao menu. Sidewalk café – an open air café offers international and Asian dishes. Open daily from 4:00 - 11:00 pm. Poolside bar - Serves light snacks and refreshments throughout the day. The banquet room can be divided into 2 separate rooms with a sound proof sliding partition. The room is equipped with microphones, sound and public address system, overhead projector, 35mm slide projector, screens, lighting control equipment, whiteboards, easels, lecture equipment, and portable stage. Full equipped business center with Fax, Internet and Email services, secretarial service and multilingual staff and two work stations with personal computers, printers and scanner.